WASHINGTON, D.C. — The Navy and Marine Corps are still struggling with oxygen system problems that have plagued the Navy’s carrier training aircraft and have clogged both services’ pipeline of new pilots, the commander of Naval Air Systems Command said during a Wednesday congressional hearing. Testifying before the House Armed Services tactical air and land forces subcommittee, Vice Adm. Paul Grosklags said the service was exploring two courses of action in light of an increase in physiological episodes that has prevented the full operation of the service’s fleet of T-45C Goshawk trainers since a partial stand-down in late March. 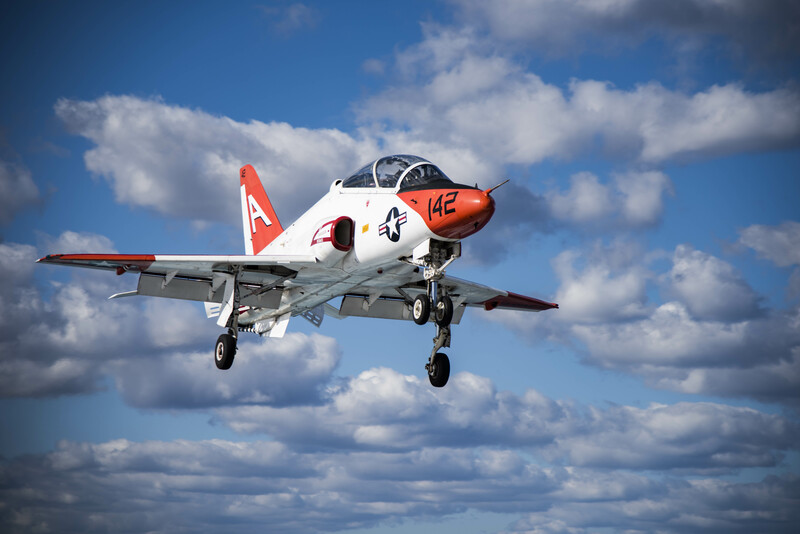 Reports of illnesses and negative physiological effects from T-45 Goshawk instructors and students spiked to 47 incidents per 100,000 flight hours in 2016 – a four-fold increase over 2012 numbers, according to figures provided in the Navy’s written testimony. In tandem the Navy is working to identify the failures in the On-Board Oxygen Generation Systems (OBOGS) that have plagued the Goshawks and take corrective actions for the long-term, as well as outfit the T-45s with “alerting and protective measures” to get the planes back to full operation in the short term. “We’re doing those two things in parallel, one is not waiting for the other,” Grosklags said at the hearing. Additionally, he said in response to a question, the Navy is considering replacing today’s OBOGS with an older liquid oxygen system (LOX) to provide air to pilots, but he called that a “longer-term solution.” Grosklags said he needs something to get the Goshawks back in the air in a matter of weeks, whereas the LOX solution could take months. USNI News previously reported that LOX, or bottled oxygen, has helped cease the physical symptoms of hypoxia – headache, tingly fingers, grogginess – during physiological episodes on the F/A-18A-D Hornets, F/A-18E-F Super Hornets and EA-18G Growlers, giving pilots about 10 minutes to safely land the jet. When hypoxia occurred on a T-45, though, the use of bottled oxygen didn’t always end the symptoms, meaning that LOX is not a valid solution for T-45s right now. 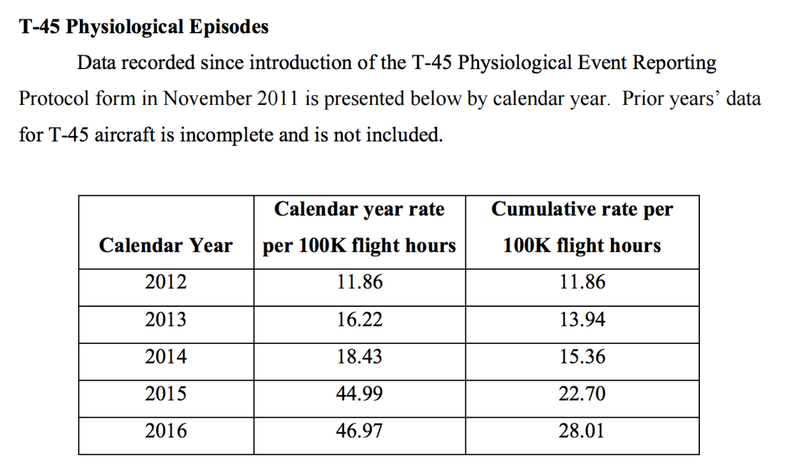 Included in the Department of the Navy’s written testimony to the panel were some mitigation measures the services have implemented to reduce physiological episodes in the trainers that include new training regimes, oxygen-monitoring units, and forming a team with representatives from the government, T-45 manufacturer Boeing and OBOGs manufacturer Cobham. None have proven so far to have definitively fixed the problem. Lt. Gen. Jon Davis, Marine Corps deputy commandant for aviation, told reporters following the hearing that the Marines would start to suffer from pilot-production problems if a solution that allowed the trainers to be fully operational wasn’t found by September. The same training pipeline is used for all naval pilots, whether they ultimately serve in the Navy or Marine Corps. “They have to be in T-45s by September or bad things [start happening]. We start to have problems with numbers in the fleet,” Davis said. A message left with Naval Air Forces on when the Navy would run into problems with its pilot production due to T-45C operational restrictions was not immediately returned. And still, while mitigation measures are underway for the trainers, the enduring mystery remains of why pilots are suffering troubling and increasing physiological episodes in not only the Goshawks but also in the Navy’s fleet of F/A-18E/F Super Hornets and EA-18G Growler fleets as well. The results of a fleet-wide study into the physiological episode issue — led by U.S Pacific Fleet commander Adm. Scott Swift — is due to do be briefed later this month.